I'll be honest: I'm not much of a blogger. Oh, I've tried it before... but it just never seemed to work out. I'm just not much for sharing my thoughts. (Quiet, shy, soft-spoken, man of few words - these terms and phrases have often been used when referencing yours truly. Of course, this doesn't mean I'm not opinionated, because that term has also been used to describe me.) Unless I see a dire need for thoughts to be made known, I usually just keep them to myself. 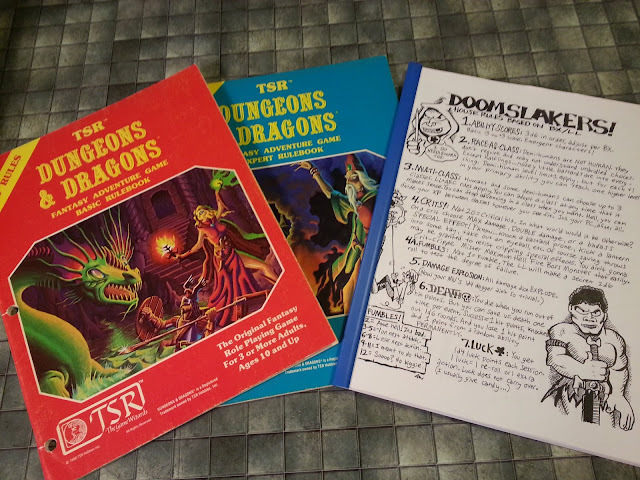 So, my intentions are to share these things, especially those related to my first RPG, the one to which I always return - even if only for a brief visit - time and again: Basic (Moldvay) Dungeons & Dragons. (More on that in a later post - probably.) I hope to use this space to share these with the millions of blogosphere travelers who will no doubt flock to my awe-inspiring, resource-rich personal Web log... or, rather, the one or two users who actually happen to stumble by and take the time to peruse this grain of internet sand.